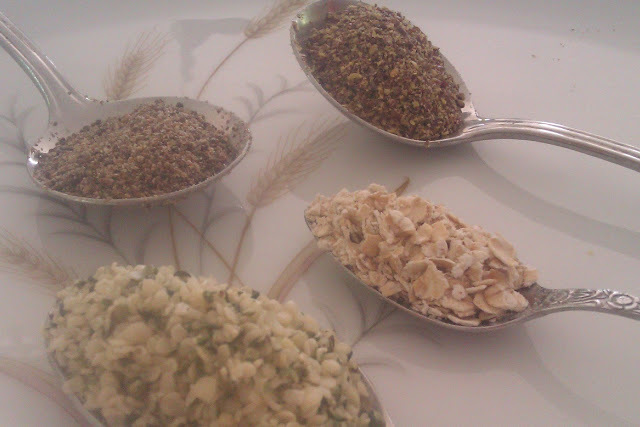 Clockwise from top left, we have here milled chia seed, ground flax seed, oatmeal and hulled hemp seed also known as hemp hearts. Can be blended to anything, adding amazing nutrition. Including all omegas, protein, fat. Mom and dad, add it to your smoothies, salads, berry yogurt and cottage cheese parfaits, you deserve it! Like hemp, chia is another raw superfood! This ancient seed was cultivated by the Azteks. It can be used a an egg substitute in some baked recipes and is one of the healthiest things you can feed your little one. Read an earlier blog post about how to prepare it, here. Soak it for up to 3 days or simply add before or after blending when child is over 8 months. Flax is insoluble fiber and a constipation remedy especially effective combined with prune water. To ease diarrhea, feed instead homemade brown rice cereal, banana, avocado, apple and other soluble fibers. Eat raw oatmeal in moderation but it is do-able! Know any others? Grateful if you would share in the comment section below!! !